Full HD Download: The 2014 ANB South Australian Revolution Titles were held at the Norwood Concert Hall on Sunday, 28th September. In this outstanding competition, you will see a large number of high quality competitors spread throughout the many different classes. September 28th, 2014 Norwood, S.A. 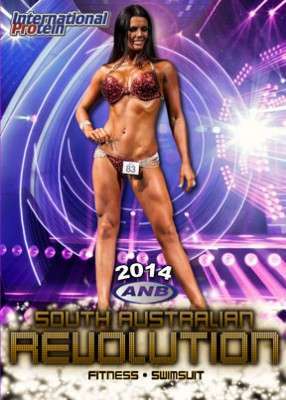 The 2014 ANB South Australian Revolution Titles were held at the Norwood Concert Hall on Sunday, 28th September. In this outstanding competition, you will see a large number of high quality competitors spread throughout the many different classes. The Men’s Overall Body Building Champion was BILLY BRYSON and the Women’s Overall Figure Champion was MARIEKE MILLER. Both are pictured front cover. Bill is an absolute legend in S.A. having won many titles over the years. Enjoy 140 minutes of outstanding fitness athletes in this 2014 ANB DVD. Every round is included through to the final posedowns and awards. Sunday, September 28th, 2014 Norwood, S.A.